In honor of September 19 being “Talk Like A Pirate Day,” here’s an “I Am” poem from a workshop I did with four kindergarten and first grade boys, including my four year old son. After we wrote the poem, my son wanted to make a video, so we did. He found and selected the images and the music, then we did the poem as a “call and response” where I did a line and he repeated it. 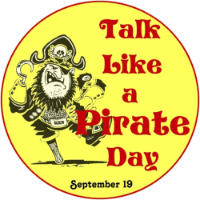 Happy Talk Like A Pirate Day! Enjoy! I Am A Scary Smelly Skeleton PIRATE! I am a scary, smelly skeleton PIRATE! I wonder where the treasure is. I hear black rusty shooting fire cannonballs and swords slapping. I see other English ships to get their treasure. I want treasure, a golden compass, and a golden ring. I pretend to play swords with you. I feel my bones cracking. I touch the shark’s teeth. I worry about my pirate ship and how it will disappear one day. I cry when my boat tips upside down. I understand that I know that you can be killed. I never dream about black treasure. I try not to kill my pet octopus. I hope to be free.